I don't normally review a book like this, but I feel that I must as the story is absolutely CRAY-ZEE. Friends, I had no idea how truly whacked out the world of Barbie is. Reading this book felt like being a spectator in a nonsense dream, where one strange yet amazing event followed another, seemingly with very little or no narrative follow-through. The story opens with Barbie, a famous movie star on the red carpet. Ken is by her side, of course, looking quite babyfaced with a "Beiberized" haircut. Barbie's bitchy costar Raquelle "accidentally-on-purpose" rips her gown. Days later, Barbie and Raquelle get in a catfight, but are rudely interrupted, when Ken is suddenly kidnapped by winged fairies! 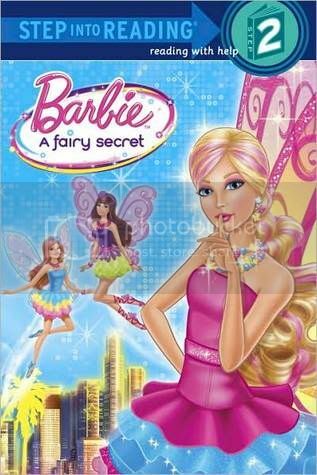 Soon, Barbie is off to the fairy city to rescue Ken from love-spell ensorcelled fairy princess Graciella, who wants Ken to marry her. Graciella's ex-boyfriend Zane doesn't like this at all. He's a real alpha-male, muscles bulging, with a curly pompadour, costumed in a purple tracksuit, lace-up boots, ugly psychedelic wings, and a random "mean-girl" female fan hanging off his arm. Zane challenges Ken to a magic duel, which of course, completely overwhelms poor Ken. Ken appears meek and feminine, but I've always thought of Ken as being pretty milquetoast so this didn't surprise me. In the meantime, Barbie is busy riding flying ponies! Yeah! Sparkling rainbow pegasi provide the final leg of her journey to the fairy city. As soon as she arrives, Graciella traps her in a magic bubble, and heartbroken Barbie looks on as a humiliated Ken is forced to bend on one knee and ask Graciella to marry him. Trapped in floating bubbles with random household junk like a lamp, a teddy bear, sunglasses and a set of dentures, Barbie and Raquelle finally make amends. The love force of their friendship bursts their prison and turns them into real fairies! Ringed by acid trails, they save Ken and release Graciella from the love-spell. Now that Graciella is ready to marry Zane, she sends Barbie and Ken home. Despite a few obvious plotholes (whatever becomes of Barbie's friends Carrie and Taylor, from the beginning of the book? Who put that love-spell on Graciella in the first place?) this short little book offers an action-packed thrill ride (Hollywood glamour! Catfights! Kidnapping! Fairies! Magic battles! Flying ponies! Imprisonment! Betrayals! Unlikely alliances! Girl power! Defeating evil!) that would put any soap opera to shame. Short sentences, simple vocabulary and super girly-girl themes with an abundance of exclamation marks makes this a breathless tour-de-force. Highly recommended. This was, indeed, 9 kinds of crazytown. I'm planning to buy this book for my 5-year-old daughter. Glad I came across your review. Will buy it this weekend. There's a movie out with the same title, right?